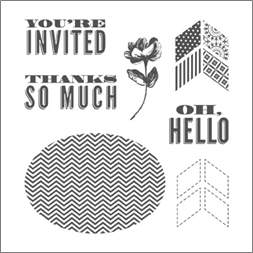 As I was looking through the 25% off Stamp sets with a customer last week, I spotted the Oh, Hello stamp set and remembered how when I originally saw this stamp set in the catalog, I thought it looked like a pretty boring stamp set. I couldn’t picture how it would come together into anything particularly cute…. and then we were given the set at Leadership last year and I saw some samples with it….. and I totally changed my tune! So, I thought I would share some of my quick and easy cards I’ve made with this set to show how it is a bit more fun than it may seem at first! Press clay flowers and it coordinates with the Oval framelits too! I’m also realizing that I use the Thank You sentiment A LOT! ha ha ha. But I guess I have a lot to be thankful for, so I need them. And don’t forget, tomorrow is the LAST DAY of the 25% off Sale and my Anniversary Week giveaway! Email me which of the goodies above you want to order and I’ll be putting together a group order. On monday, if we have enough orders placed, I will draw a name for at least $25 in hostess benefits and let you get more free goodies! Have you been wishing you had a fast way to create a pile of handmade cards to have on hand that you’d be proud to send out? And do it without breaking the bank too! If so, you should check out this new Everyday Occasions kit! When we were at Founder’s Circle last week, they told us that these kits were finally going to be releasing this week. They are meant to be a great introduction to someone who has never stamped before; but I have to say after looking at the cards, that it looks like fun to me! Like this love card, how fun is it?! Wanna see them? Check it out! I know, cute…. right? And I love that they can be used for girls or guys! The best part? Its only $29.95… so that is less than $2 a card! Plus you have ink and a stamp set you can use later. Way better than getting a card in the store! This may not be available through the online store, so if you are interested in purchasing a kit, please email me at jennifer@nwstamper.com and I will get back to you right away to get you all set up with a kit! Well, I’m off to work on holiday card samples for my 12 weeks of Christmas newsletter (get on the list now) and upcoming Holiday Card Stamp-a-Stacks. I’ll be back tomorrow with some fun projects to share! Ever have one of those months where you swear you can’t keep up and yet you look back and try to figure out why you were so swamped? Well, August apparently was that month for me! 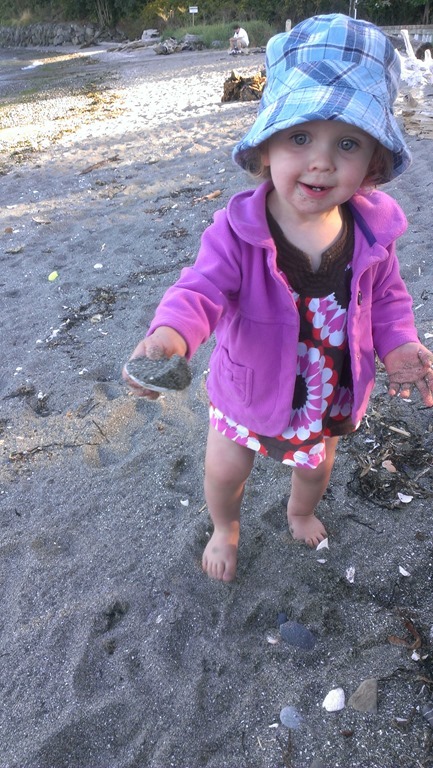 Everytime I thought I was about to get caught up, I had something else that was starting to run behind and needless to say I felt like the proverbial headless chicken running around my house. Thankfully, I got most of my major projects done before the Holiday weekend and my awesome hubby planned the perfect Anniversary getaway! You see, Sept 1st is our wedding anniversary and this year he planned a secret getaway… I had no idea where we were going until we got there! Plus he was extra awesome and told me to pack some craft stuff to take with us! Isn’t he the best! 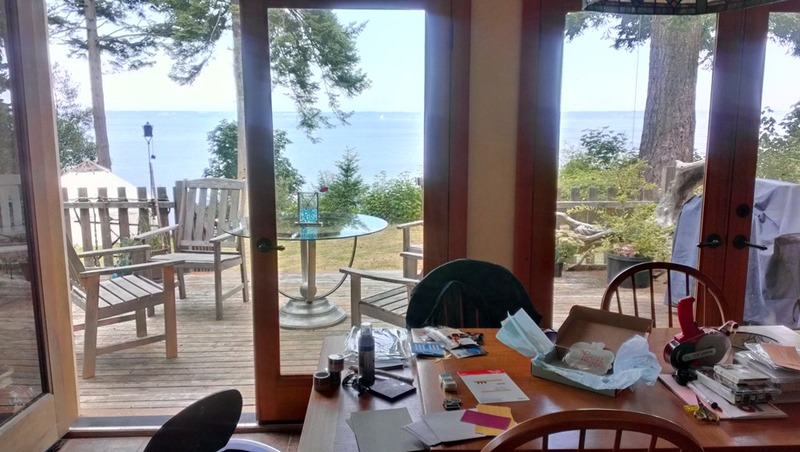 Anywhoo – the trip was fantastic and exactly what I needed to relax and get re-energized! Hopefully, you were able to enjoy your holiday weekend as well and get some “you” time in as well! 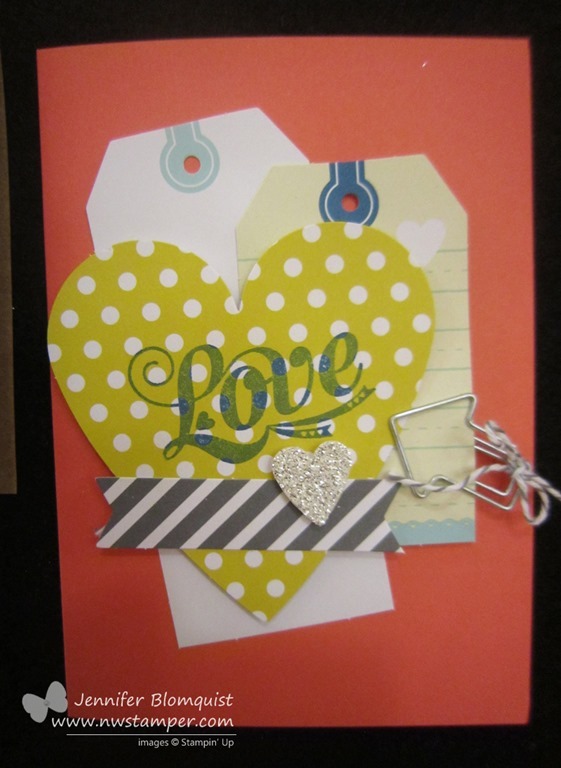 I was going to share one of the cards we’ll be making at my Cute and Classic card class this Friday, but I discovered that the photo quality was pretty bad. So, that will be my post for tomorrow and in the meantime, I thought I’d share an idea for an almost-one-layer card using the Wildflower Meadow stamp. 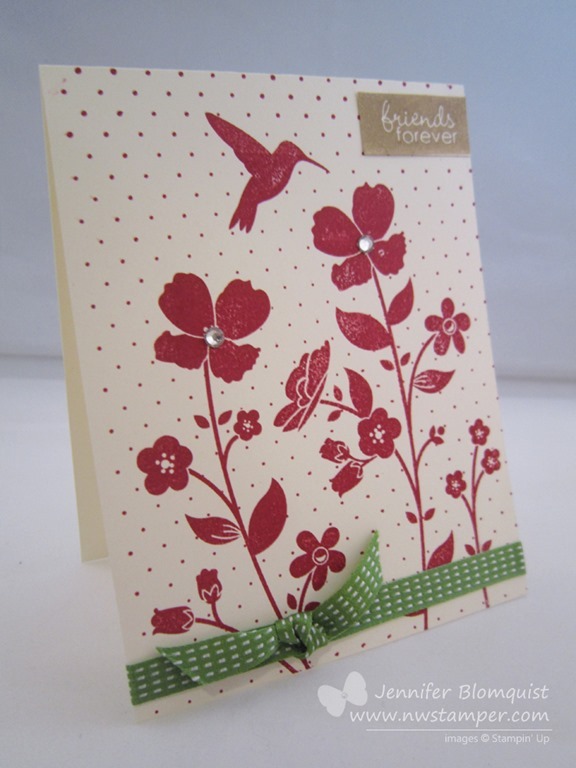 Since the Wildflower Meadow stamp is basically a background stamp, it does most of the heavy lifting for you in this card. I just stamped the front of a Very Vanilla cardbase and then added a couple rhinestones for bling on the flowers, some ribbon around the bottom of the card, and a cut out snippet from the Banner Greetings hostess stamp set for the sentiment in the corner. If you wanted to step it up a bit, without adding layers, you could use the Wildflower Meadow embossing folder to dry emboss the flowers on the front for a little extra oomph! So turns out when I start working on something, I can get really focused on that task. In the case of last week, that task wasn’t any of the handful of crafting projects and event prep I needed to work on, but instead was an even more daunting task – picking a preschool for Nicholas! 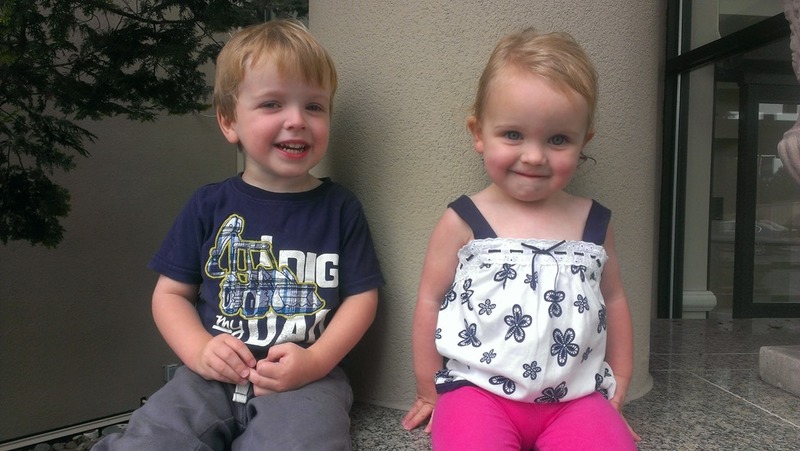 Awww….aren’t they getting so big? I thought it would be a quick and easy thing to figure out, and I’d be back working on my other projects right away. But, no…. there are so many choices and variations. Thankfully, we were able to find some good options and start the process for getting him enrolled, so now I’m able to get back in the crafty mindset! 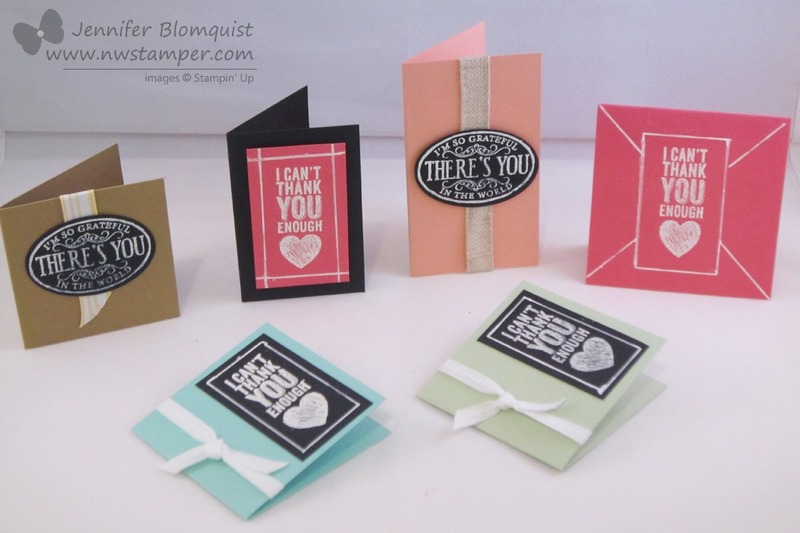 And first on the docket – Thank you cards! I always like to send thank you cards to everyone who places an order with me and I wanted something bright and cheery to remind us that summer hasn’t quite ended yet! I used 3 of my favorite items right now: Washi tape, Flower Shop bundle, and the Oh Hello stamp set to put this together. So, if you’ve ordered with me in the last few weeks… check your mailbox for your own copy of this card! If you’ve ordered with me in the last month and NOT received a card, please let me know! 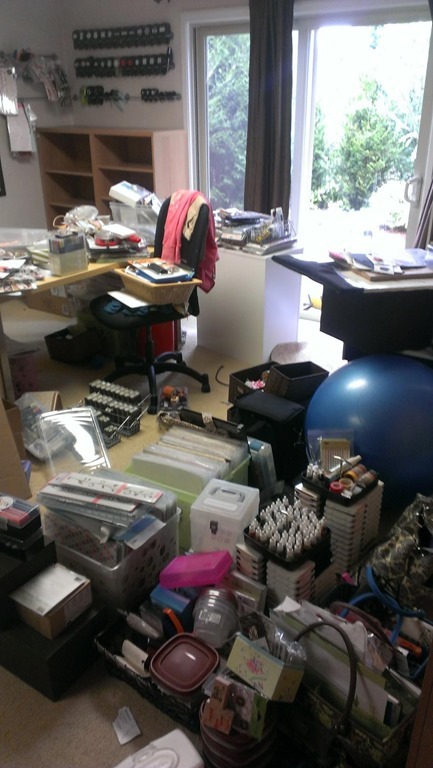 There have been some hiccups in the Stampin’ Up! ordering system and some demonstrators have not been receiving notice about orders placed. I want to make sure I’m giving you the best possible service, so if you haven’t heard from me, let me know so I can fix it. But no matter what, THANK YOU for stopping by and please come back soon! Quick & Easy Thank You Card for a new Design Team! 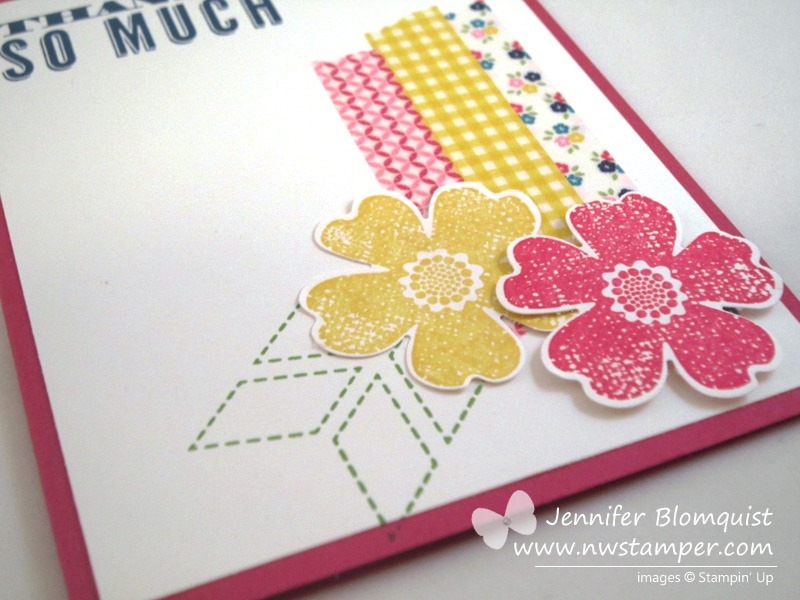 Today is the kick off for a new blog that I’m excited to be a design team member for – Stylin’ Stampin’ Inkspiration! It is a blog that will have daily posts to help give you new ideas and project challenges to inspire new ideas for you to try at home! Most of the posts will have a particular theme and have many of the design team members showing you different takes on that theme. Fun, right? I will tell you this card was inspired by a card I saw from my friend, Katy Kirwan, and while the finished project doesn’t really look anything like what she created, I still like them both. 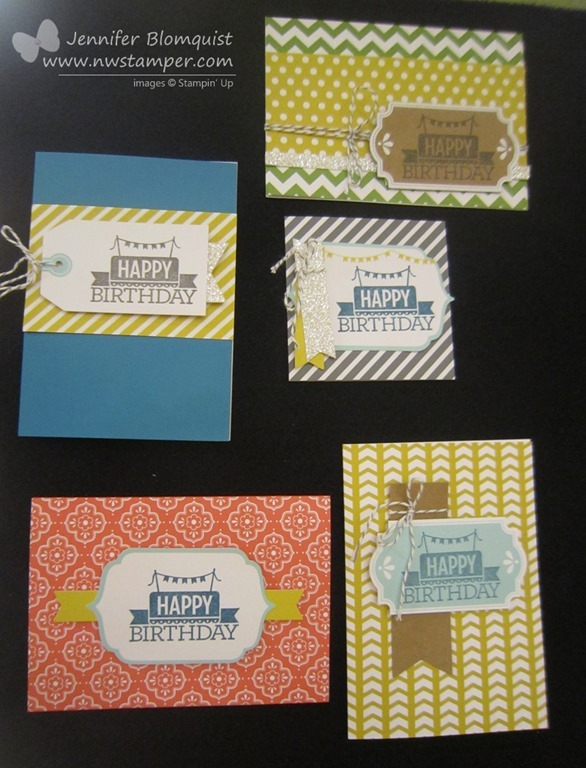 To create my card, I created my own designer paper by using the Chevron background stamp from Stampin’ Up! and then layered on the punched out sentiment. It still needed a little something, so I added some of the Pear Pizzazz Chevron ribbon (sshhh, don’t tell anyone I used two different greens on this card!) and while I was worried the fact that the stamped and the ribbon chevrons go in different directions, I still think it totally works! So, what do you think? Quick? Easy? But totally fun! I’m actually using this for my Cute & Classic Card Class tonight, so hopefully they have fun with it too! And if you are looking for more quick and easy ideas, hop on over to our Inkspiration blog and check out all the fab ideas for more great projects. Oh, and before I forget! It’s Here! The Stampin’ Trimmer Rotary Attachment is now Available! Ok, I may be the only person on the planet who is excited about this, but I-CANNOT-WAIT to order my rotary trimmer attachment. 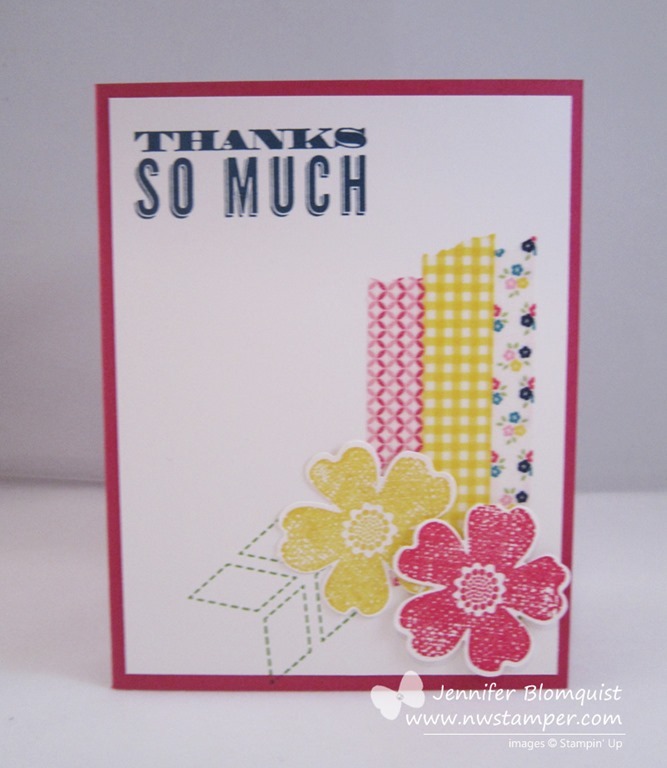 I have found that I really LOVE my Stampin’ Trimmer and the little blades that come with it work great. But when you are cutting grittier material (like glimmer paper) or want to cut more than one sheet of cardstock at a time, the little blades just don’t do as good a job. So I had been periodically missing my rotary cutting board (except not missing the fact that that Fiskars board could not cut a cardbase straight if I had to!). But now I have the best of both worlds! This replaces the clear arm and track for the little blades and the rotary attachment is available as of 8/9/2013! So, I’ll be ordering mine today and will let you know how it goes. 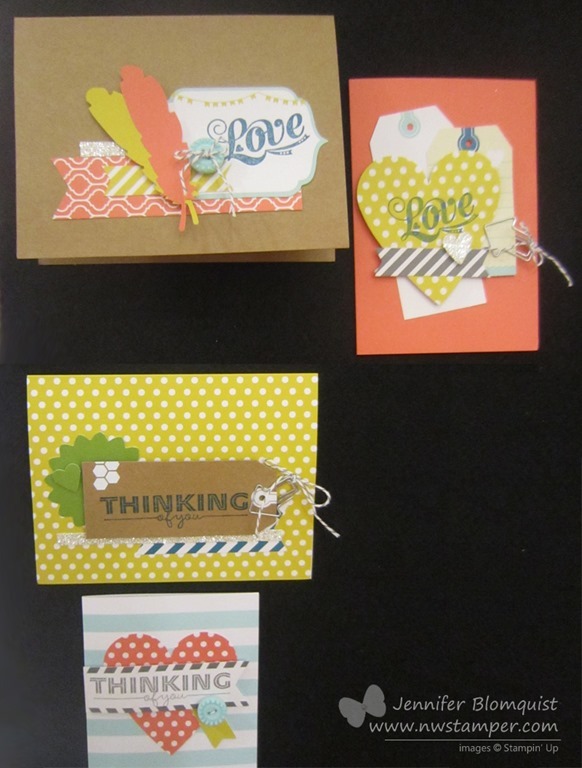 But my room is just about ready to go – and I promise I’ll share pictures of the reorganized space this weekend – so I wanted to stop back over here on the blog to say hello and share a set of cards that my mom, Kathy Thisted, made for me that I thought were so cute! 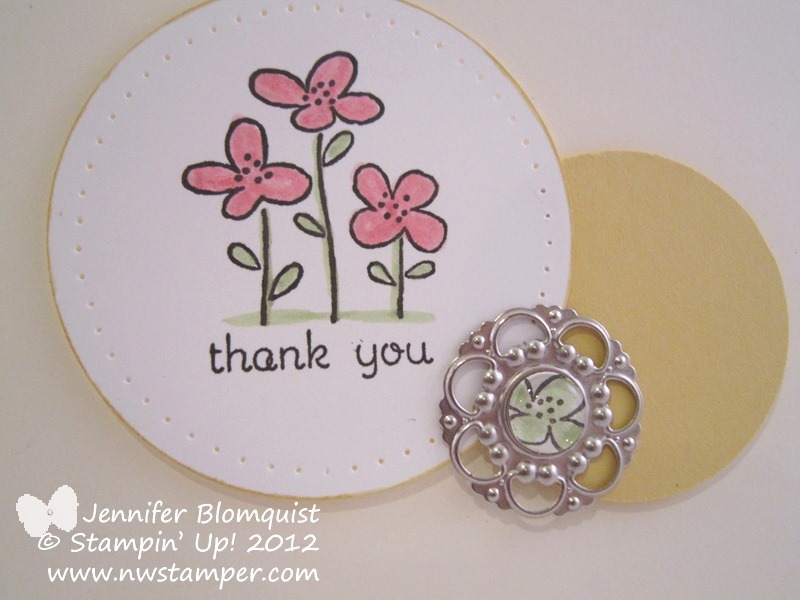 I loved these little mini thank you cards and thought they were a fun way to use the new Chalk Talk stamp set. 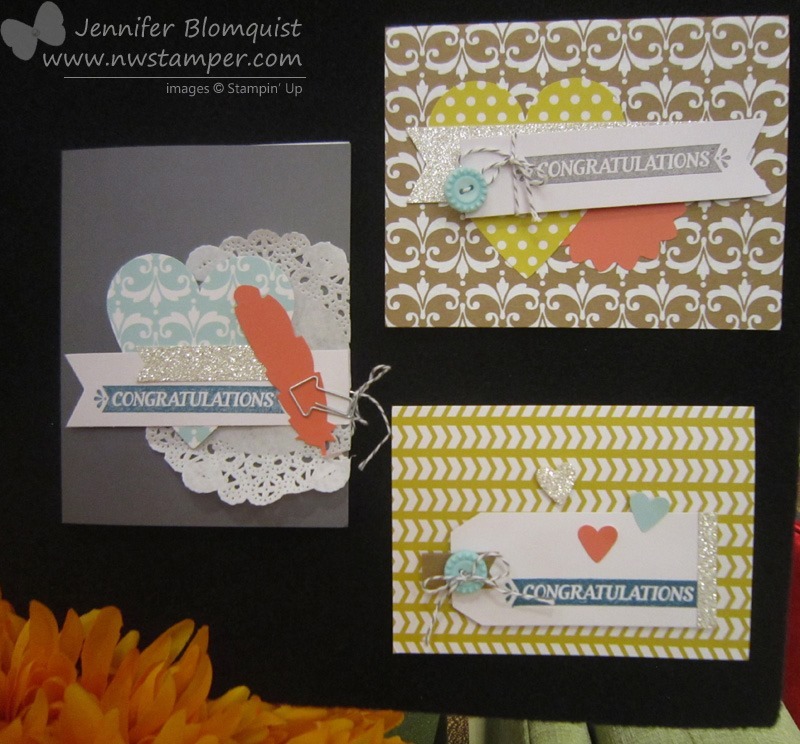 Since the stamp set coordinates with the Chalk Talk framelits (and gets you a discount when you buy both in a bundle), many of the samples I’ve seen used the framelits with the stamps. So I loved seeing some quick ideas using the stamps without the dies. Join me tomorrow as it is the monthly blog hop as well the kick off of a new blog that I am an inaugural design team member for! Should be lots of fun. See you tomorrow! You would think that the fact that I have two toddlers running around my house would mean all the cards I make are super fast cards…. Nooooooo, that would make too much sense! ha ha! This stamp image is from the Easy Events stamp set. Of course they are retiring this stamp set on me! I love having stamp sets that have images and sentiments for a bunch of different occasions. Sure there is For the Birds and Embellished Events… but I have a soft spot for Easy Events. Some piercing around the circle (using the Essentials Piercing Pack) and a Designer Build a Brad for an extra accent. And if you are curious, I just stamped the flower image again and then colored it in with the Certainly Celery marker and punched out just the flower head to go in the center of the designer brad. Add some sponging and you are done!